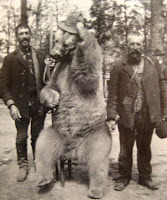 They say that the miracle of the dancing bear is not how well it dances, but that it dances at all. That reminds me of some companies I've worked with over the years. They were bloated, ponderous business enterprises that were slow to react to change and burdened down by poor processes. The miracle is not how well they survived, but that they survived at all. In a slow economy, you cannot afford to let your ponderous business slow you further. Fortunately there are five signs that can warn you if your business is ponderous and slow. Frankly, as a business owner, I hate surprises. Usually because they are rarely good surprises. I can't remember the last time my accountant called me with good news. Do you understand what I mean? Do you get too many nasty surpsies? If you do, there is a serious problem with your information systems. Do your subordinates know The Big Picture? Are they on board and pulling in the same direction? Are all the teams playing nicely and sharing information with one another? Have meetings ever turned into sessions of "Pass the Blame"? Do people complain about a lack of communication? If you understand what I mean than you have a serious information problem. Are you constantly fighting fires? Are you being pulled back and forth by the crisis of the hour? Have you ever had to abandon a crisis to fight a bigger disaster only to be summoned to battle a catastrophe? Is there always something that demands your immediate attention, right now or the world will end? If so, than you have a serious problem. Have you stopped to think what a bad decision can cost your business? Have you ever wondered if the data you use to make decisions is accurate? Do you have evidence of a time when bad data lead to a bad decision? Can bad information cause you to make a career ending error? If so, than you have a serious data problem. Does it take forever to get answers to questions? Do you wait hours/days/weeks for reports? How long does it take a decision to be implemented? How does your company react to adversity? Does your business react smoothly, avoiding obstacles by adapting or does it grind to a halt? If not, than you have a serious problem. You need to retool your business! You need to trim down and prepare for hard economic times. You need to accomplish more with less and that's just the hard truth of it. If your business is slow to react, does not adapt easily to change, is constantly on the brink of a disaster or has concerns about the quality of information then you need to contact me immediately. I will happily explain how I can solve those problems for you.